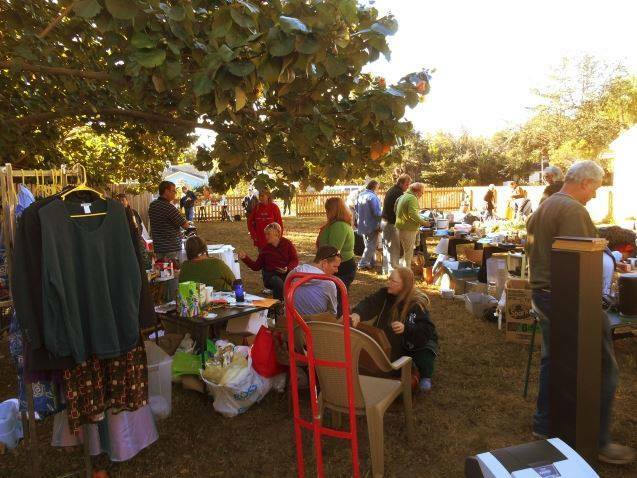 Mother Mana’s 2014 New Year’s Resolution was to help transform an empty, unused city lot in Gulfport, Florida into a beautiful, abundant space. –A space for growing food, kinship, culture, and greater self-sufficiency. 2014 has officially come and gone, and we are happy to report that our (collective) envisioned transformation of that vacant city lot is well underway; and the friendships and connections that have come about as a result of this project are greater and more rewarding than we could have ever imagined. January 2014, we placed an ad in the Gulfport Gabber inviting community members to gather and discuss the potentials of a community garden. Several people attended the meeting and expressed an interest in creating a space that would foster community, and set Gulfport and South St. Pete on a path toward greater food security and self sufficiency. After this initial meeting, the group began meeting weekly to generate a list of specific goals, and get clear on a vision for the garden. As a result of this work, Mother Mana was awarded two full scholarships to a permaculture course taught by Koreen Brennan of Grow Permaculture. 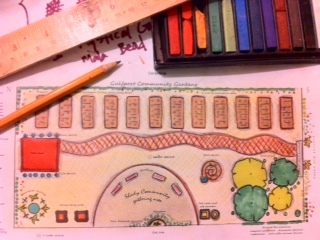 During the 6 week course (which began March 2014), Mother Mana teamed up with fellow students Sara Perszyk & Lisa Fletcher to create a design and site map for the garden (based on the vision and list of goals agreed upon by the members of the community garden). Upon completing the permaculture design course, Mother Mana brought the final design back to the other garden members, and since that time everyone has worked together as a team to make our collective vision a reality. 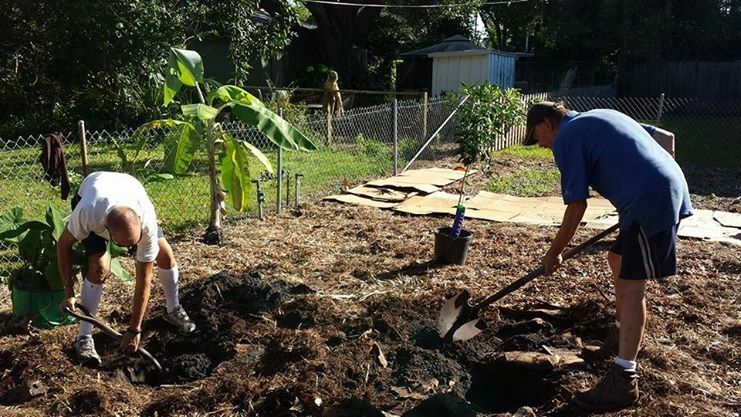 We began the first physical transformations of the space in September 2014, hosting a “work party” where community members came together to sheet mulch the property. In October we began planting a small food forest in the Northwest corner of the property. 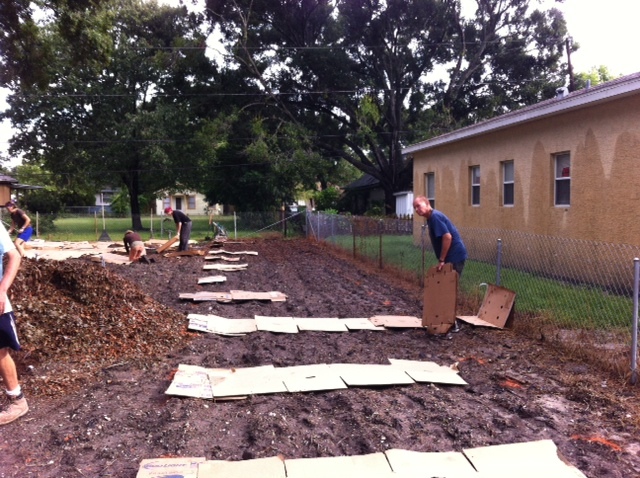 Volunteers came together to mulch the garden, and also hosted a rummage sale which raised over $1,000 to be put toward monthly water bills, the growing of food, and education initiatives.. –Gulfport Grind generously donated coffee for the event, and Larson & Son Lanscape delivered a load of topsoil for our bed. January 25th we reaped our first turnip harvest from the garden’s small food forest, and also transplanted starts of beans, peas, cauliflower, and broccoli into the raised bed. And February 1st we started construction on the tool shed. What a year! 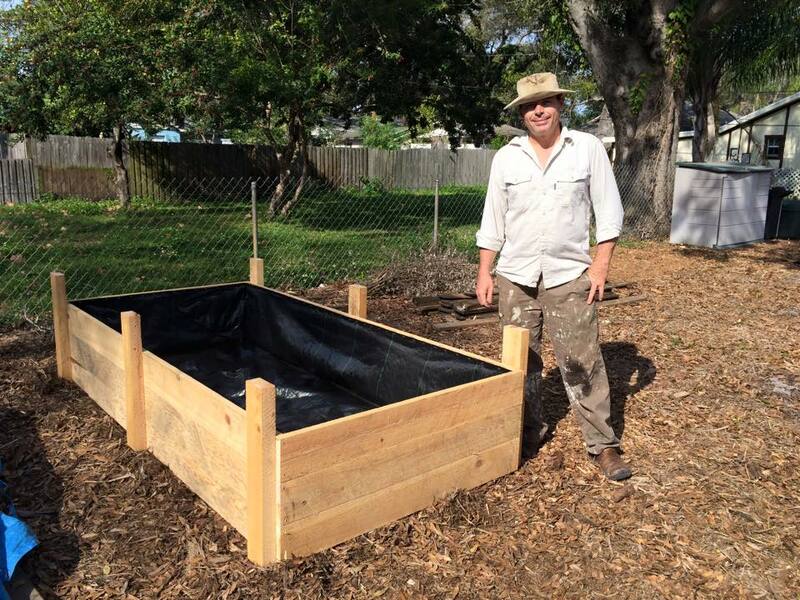 To read in-depth blog entries chronicling the progress of the Gulfport Community Garden from 2014 to 2016, follow this link.